Betty was the last survivor of 10 children. "I beat them all", she use to say - thanks to my bulldog, Shannette Matthews. Betty was preceded in death by her husband, Troy Stiner; and son Roy Stiner. Betty is lovingly remembered by a daughter, Judy Nielsen and son in law, Micheal Nielsen. She has seven grandchildren; seven great-grandchildren and seven great-great-grandchildren. Betty spent most of her working life at French Cleaners Shirt and Laundry owned by the Sand Family. She retired from there to work for Duane Hagadone pressing clothes and linens. 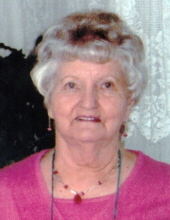 Betty had many hobbies and activities she enjoyed including, gardening, cooking , baking, traveling and family gatherings. To send flowers or a remembrance gift to the family of Betty Stiner, please visit our Tribute Store. "Email Address" would like to share the life celebration of Betty Stiner. Click on the "link" to go to share a favorite memory or leave a condolence message for the family.